I just love a red front door, something about them to me says "Welcome, come on in and sit a spell." We'll be repainting our house next summer, and the first thing I did was pick out the red for the front door. The rest of our home is a sandy colored brick in front and siding to be painted along the sides and back of the house. Similar to the brick color in the third image down on the right side. We'll be painting all the window sills this summer with a fresh coat of white. The siding and front door will wait until next spring/summer. We'll be replacing and widening the driveway at that time as well. So it will be the perfect time to paint and not worry too much about getting paint on the driveway. In the meantime, here are some beautiful red front doors in flickr. Imagine my delight when one of the doors that came up was from Petite CasaPinka... I had to include it. It's the large one in the center. Petite CasaPinka belongs to... well, used to belong to, she has since moved... Pink Mohair and CasaPinka (same person). oooooooooooooooooooooh I love red front doors. You are so right that a red front door is inviting! Love all those photos! 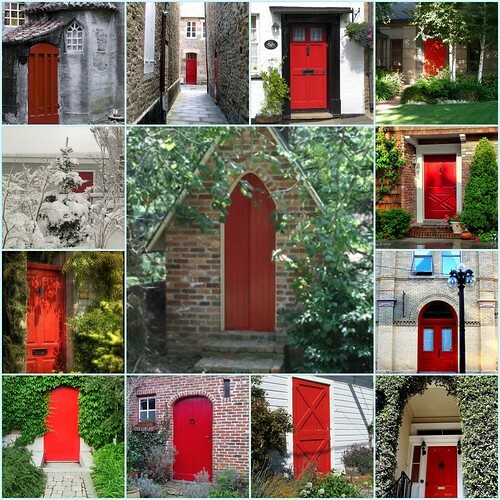 I love red doors, and you're right... it wont be hard to repaint if you decide you dont like it. I'm craving a turquoise door, but my better half is horrified at the thought. We may go for black... I keep thinking about how good a Halloween wreath will look. I've seen some gorgeous turquoise doors though. Has he seen a few photos of how beautiful it could look? Black is actually my second favorite color for a door. It looks so crisp and sharp, and it's fairly versatile if you change up decor for the seasons. When we lived on base in the Philippines, the bus stops were getting a new coat of paint, bright blue. The workers left for lunch, but left all the stuff they were using to paint lying by the bus stop. My sister and her friend (3 or 4 years old at the time) were playing out front of her friends house (sitter was supposed to be watching them). They walked across the street and started playing by the paint and got bright blue paint all over themselves, particularly their hands. Not sure how exactly, she said they left the covers off of the paint and they thought it was dry and ended up putting their hands into wet paint. Anyway, they went across the street and knocked on the door so they could wash themselves off. The sitter didn't answer (Not sure why exactly, probably on the phone) so they proceeded down the street knocking on each door in turn until someone answered... 5 doors down! The Naval Housing office was NOT happy with the workers. They had to send people out to repaint all of the doors and clean paint off of the sidewalks and even a few carport poles. It was unfortunate circumstances, the sitter should have been watching them, but the paint supplies never should have been left open like that. I'm w/ you, worth the extra work to have it red. Unfortunately mine is blue, it's a pretty blue though. I love the story you told Sandra, that is too funny. Guess what?! I have a red door!! :) It's more of a cranberry color, but I LOVE it! :) Good luck, and great choice! The color is Posh Red by Valspar if anyone wants to peak. Oh that is perfect.... I can't wait. Your color ideas are gorgeous. Susan: First, the important thing... your daughters are adorable! I just LOVE the concentration pictures, I always did that with my tongue when I was younger and concentrating too! I love the Jack-o-lantern's and white doors do lend themselves well to decorations through all the seasons. We had a white door in the last house (the whole house was white!) which was always a nice clean slate. I do hope you'll join in this coming holiday season with pictures of your door, actually since a few of us like seeing doors, I may have to do a door round up once a month so we can share our doors through the seasons and the holidays. I just love doors since they are the first welcoming sign visitors see to our homes. Susan: Good to know I'm not alone. I love the pumpkin pictures and your girls are precious. Barbara- I think the monthly round-up would be fun. That's settled then... I already have Mr. Linky for Monday Musings, I'll just use it for a front door round up too :) For anyone that wants to join in. Monique, I look forward to seeing your door! Susan: that's good for me to know. I'm thinking the first of each month would be a good time. Or is that too early, in terms of people having their doors ready for Christmas, Halloween, etc? Maybe I'll take a poll. For seasonal doors I think mid-month would be best. Susan: Funny you mention that, I decided on the 15th. Hopefully people remember to take their 4th photos early! I just painted my front door red yesterday after wanting a red door for a few years now! I didn't realize it had any symbolism or significance, I just LOVE the way a red door on a home makes me feel. The man at the paint store warned me that it would take at LEAST two coats, and it will.. I've only done the first coat so far.. but even streaky red... I'm already in love with it. My decor is very folk artsy cottage country and I already have a red barnwood sign with our name on the white post of the entry and an antique red milk can beside the door with a birdhouse sticking out of it... I will be doing a blog post on my front door as soon as I'm done with all the coats of paint.. such fun!